A tropical disturbance has rapidly formed in the monsoon trough over the past 24 hours. Deep convection is increasing and it appears that a circulation at the surface has closed off. We now believe that this feature is a tropical depression. As of 9:00 am edt / 8:00 am cdt the disturbance was centered near 11.0° N / 91.0° W or about 280 miles west southwest of the coast of Nicaragua. Top sustained winds are estimated at 30 mph. The disturbance is nearly stationary. Forecast models are confused at this time. 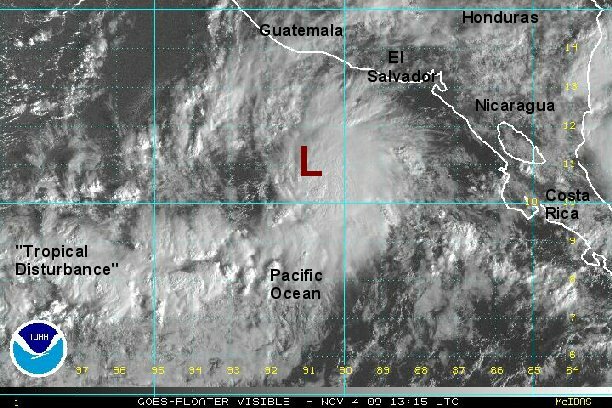 They develop a low and eventually take it parallel up the west coast of Mexico (offshore) in several days. The models don't understand that a seperate system is off of the eastern side of Nicaragua too. Either the Caribbean low will cross over as this one weakens or this is the actual system to move up the coast. Interests in southern Mexico and western Central America should follow the progress of this system. It looks like this noname tropical depression will be only shorted lived. A very well defined low level circulation has moved from under the deep convection. After moving away from wind shear, convection is giving it a second go near the circualtion center. conditions appear more favorable for the disturbance to develop compared to a few days ago when the low formed. It is interesing to note tropical storm Ida not far away over eastern Nicaragua. As of 4:00 pm edt / 1:00 pm pst the tropical disturbance was centered near 11.0° N / 92.5° W or a little over 200 miles south southwest of Guatemala. Top sustained winds are estimated at 25 mph. The disturbance is nearly stationary. Forecast models do strengthen this system off of the Mexican coast. 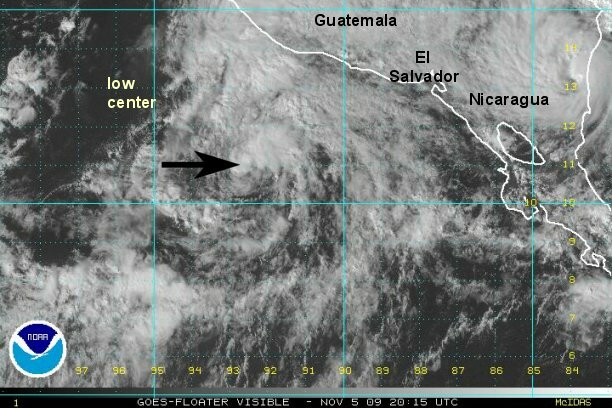 The nonamed tropical depression moved into El Salvador over the next 24-36 hours bringing severe flooding.